I recently received an email from Dan Vuksanovich (a partner at Gravity & Momentum). He claimed they make the only stage blood in the world that is both safe enough to get in your mouth and will wash out of / off of anything with just warm water. I'm not sure about all the other fake blood products out there - but this sounded great. He offered to send me some samples - an offer I couldn't pass up. Sure enough, they arrived a few days later. Blood Jam - Blood Jam is an “all-in-one” stage blood product which can be manipulated in a number of different ways. Out of the jar Blood Jam is a very thick stage blood which can be used as-is for makeup and gore effects that do not run or drip. It’s great for skin, costume, set dressing, or even for zombie crawls where you don’t want to worry about blood getting everywhere. Blood Jam can also be thinned with water, heated and/or frozen to create a variety of useful effects. Blood Juice - If you’ve ever tried diluting a thicker blood product for maximum splatter you know that there’s a point past which the color simply disappears. Blood Juice stage blood is incredibly thin… so thin you can spray it with a spray bottle, and it still maintains its realistic coloring. Blood Juice is splatter-rific, perfect for exploding, gushing, fast running, or dripping blood effects. Blood Syrup - Blood Syrup stage blood sits in the middle of our blood product line from a consistency standpoint. While Blood Jam won’t run at all and Blood Juice runs all over the place, Blood Syrup oozes and is perfect for slow to moderately bleeding wounds. 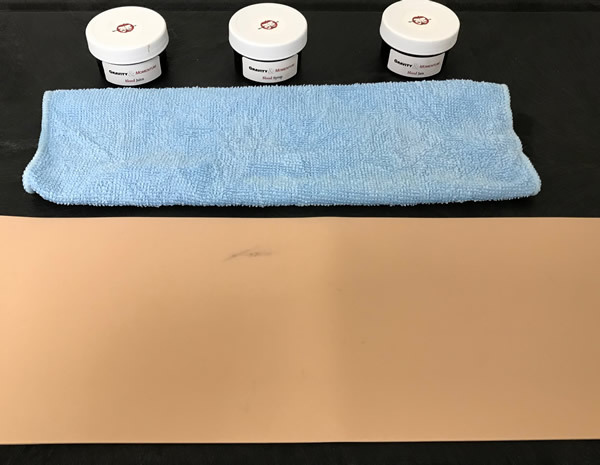 I decided to test on a piece of spare task trainer latex and on a microfiber cloth. The Blood Juice was a little more 'greenish' then I had hoped, but I loved the Syrup and the Jam. From left to right we have: Blood Juice, Blood Syrup and Blood Jam. I poured some on each material and let them sit/soak in overnight. The next day I hand washed with warm water, and some hand soap. It all came out - fairly easily. To be honest, I was a little surprised. There was zero staining. I haven't tested any other fake blood products in regards to staining, but I have used Ben Nye in the past and remember liking it. I know it can be used in humans mouths as well. 24 hours later, a quick wash - totally clean / no stains! All in all this stuff was really impressive (except for the slightly greenish Blood Juice), and I can fully recommend it. I have added their link to the moulage page for future reference. UPDATE - Dan tells me the Blood Juice isn't supposed to look that that - and that they will do a better job at making sure that samples don't go out like that again. Any customers that received off color product would get an immediate free replacement at no charge. Good to know! I just heard about this company - OSSimTech. I've added them to the Links page. OSSimTech designs, manufactures and sells VR open surgery simulators. We are a high technology firm with strong intellectual property and unique knowledge of VR. Our core business is training simulators for open surgeries.